Supertramp | Kris Johnson's Blog…sort of. hope you find your paradise. For whatever reason, I processed the song differently that night, and it was like hearing it for the first time. Underneath that familiar and—dare I say—beloved melody Roger Hodgson was telling a story that I’d never really heard before. Roger Hodgson was telling the story of a stone cold playa: the early morning lover who must be movin’ on. 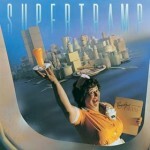 I’ve been listening to Supertramp since I was six! How could I possibly go twenty-six years without realizing that “Goodbye Stranger” is about the king of one-night stands? It’s enough to make one question everything. Actually, I think the key is that I have been familiar with the song for so long. When I was six years old, I hadn’t the faintest idea why Hodgson would be saying goodbye to Mary and Jane, much less what a one-night stand was. Yet I heard the song enough times (thanks to my older brothers and the wonders of vinyl) that the whole of it became imprinted in my memory and it never occurred to me during the intervening years to apply my expanded knowledge of the world to a song I’d been listening to since I was six. Now that I’m done having my epiphany I have to go figure out what the hell “Lord is it Mine” is about.